GPT provides Big Data processing and business intelligence applications through our Solvryn℠ Enterprise system. GPT has developed our own Trade Secret system to ensure high quality and efficient work flows for the following services: data exchange, data validation, automated enrollment processing, deal management, rate management, advanced billing, accounting, forecasting, CRM, and data analysis. Solvryn℠ Enterprise is secure and highly scalable, with role-based security that includes embedded segregation of duties logic. The Web-based system is flexible and integrates multiple data flows including: usage, generation data, billing and payment information, detailed customer information, GHG emissions, weather data, and supply information. Solvryn℠ Enterprise supports multiple commodity and renewable product types, enabling real-time access to customer interactions with embedded business intelligence. Solvryn℠ Enterprise delivers data exchange and a non-intrusive protective layer of real-time filtering. Our clients use the data and analytics to uncover actionable insights and implement innovative programs and services. Solvryn℠ Enterprise has a real-time validation monitoring feature that enables our clients to proactively address data gaps, questionable data, and customer defaults. Our clients' success directly relates to our success. Consequently, we are motivated to provide services that improve efficiency and accuracy. We achieve this through the utilization of Solvryn℠ Enterprise. The advanced functionality available in Solvryn℠ Enterprise is proven and is continually being enhanced to meet the new advancements in the energy industry. Our dynamic data processing interface enables us to exchange various file formats with utilities, system operators, and our clients' existing systems. Utilities across North America do not utilize standard file formats or exchange processes. Consequently, we have developed automated procedures to handle the most difficult data retrieval processes and file formats delivered by the utilities. Solvryn℠ Enterprise ensures high-quality and consistent exchange, while managing large volumes of data in utility Electronic Data Interchange (EDI) and other utility formats. 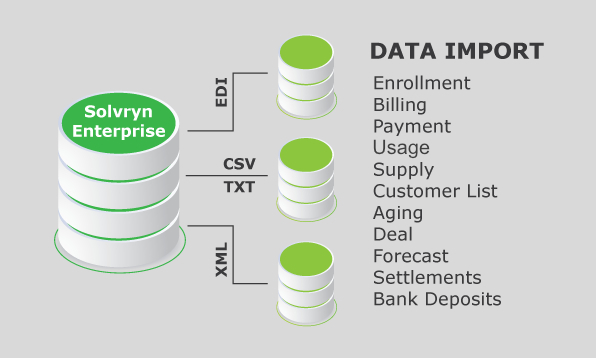 Solvryn℠ Enterprise captures data from a myriad of sources and consolidates the data into a single data repository. As a result, we are able to offer our clients a single platform for all data management, and a variety of innovative services built on our comprehensive enterprise system. Solvryn℠ Enterprise will consume EDI, CSV, XML or other nonstandard file formats to efficiently obtain all available information from the utilities. GPT utilizes advanced automated routines to acquire data from even the most difficult utility processes. Solvryn℠ Enterprise has multiple layers of validations that automatically identify suspect, corrupt or missing data delivered from the ISO/utility. It subsequently applies proprietary validation criteria for issue identification, error resolution and verification protocols. These validation layers can be customized through Business Rules defined by the user. Any issues that require manual resolution are automatically flagged in the Web portal validation dashboard for review by staff. These processes and protocols ensure that data is checked and corrected within required time frames. 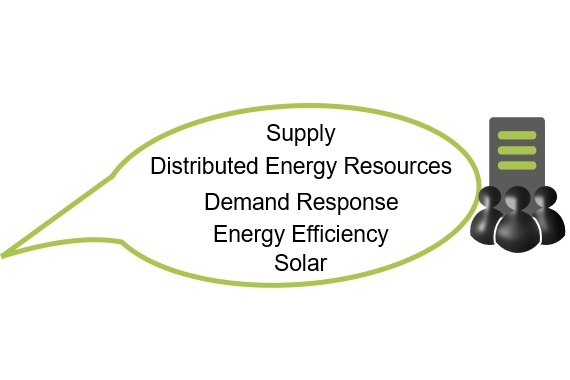 In addition, Solvryn℠ Enterprise includes a Supply and Resources API specifically developed for retail energy portfolio management applications. Our single repository enables our clients to use third party applications to extend the value of the available data and manage the complete cycle of their data, from the enrollment to online customer service. Solvryn℠ Enterprise was developed to handle different products, rate structures, and billing formats. Solvryn℠ Enterprise has a sophisticated set of billing types that can be selected by the user. The billing can be automatically produced and sent directly from the Solvryn℠ Enterprise system, sent to the utility, sent to a client's legacy billing systems, or sent directly to a customer. 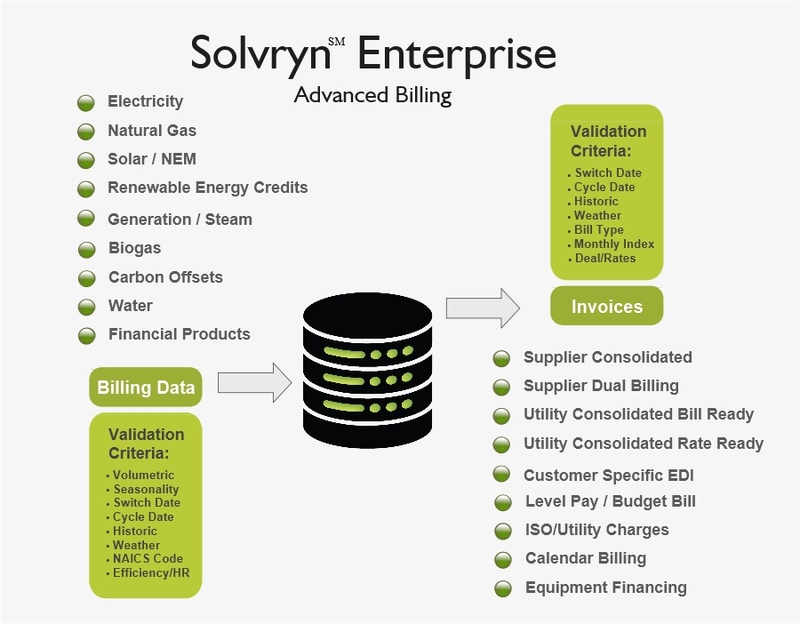 Solvryn℠ Enterprise offers Rate Ready, Bill Ready, dual billing, or supplier consolidated billing (including the utility distribution charges). There are numerous choices that our clients need to make in regards to the billing calculation, format and delivery. We have developed the flexibility to handle a wide range of billing options. Solvryn℠ Enterprise can create complex consolidated multi-tier bills, simple single rate dual bills, and many other variations in between. The billing system is integrated with a very advanced deal entry system. The deal entry system enables our clients to control the product type (i.e. electricity, natural gas, water, REC, etc.) and the contract terms that define the deal (rate class, index, fixed, multiple tiers, calendar, etc.). In addition, the deal entry module contains an advanced grouping function that enables different rates or pricing offers to be applied to specific groups of customers. This is very useful in mass marketing or mass enrollments of several accounts with the same pricing terms. The group deal functionality also can allocate specific deal volumes across multiple accounts, based on business rules defined by the user. This functionality is very useful to easily update different program offers, provide convenient pricing for multi-site customers, and can be critical for multi-site customers. Solvryn℠ Enterprise also has other advanced billing functions that were developed to meet specific requirements. As an example, we have a very extensive utility tax module that utilizes business rules to accurately calculate different types of tax and fee structures ranging from volumetric to fixed fees. We have a usage parsing module that can convert cycle data to calendar data and bill on calendar months to coincide with wholesale supply transactions. We offer a sophisticated electric rate module to enable sophisticated time of use rates, seasonal rates, utility distribution rates, tiered rates, regulatory fees, and numerous other billing components that can be user defined in the business rules. Our ability to obtain smart meter, Green Button, Orange Button, and HAN data enables us to provide timely and accurate bills utilizing the available interval data. The advanced capabilities increase the accuracy of the bills and can accelerate the billing process. Now your staff and management can have user friendly and real-time access to usage information down to the meter level. The available business intelligence tools empower you to take a proactive role. Tightly packaged data aggregation (utility data, customer data, weather data, etc. ) with filtering capabilities will help you gain meaningful insights from customer load profiles. 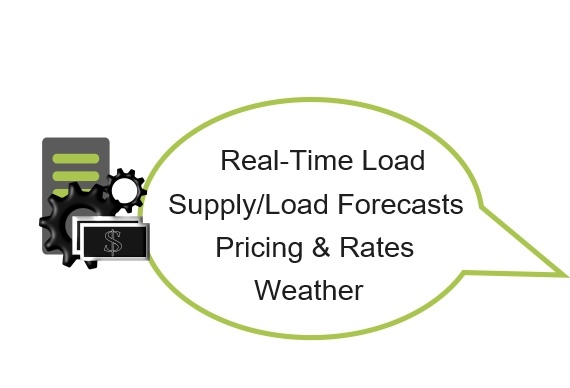 The load forecasting and analytic applications assist in better predicting usage patterns based on weather or other statistically relavent drivers. 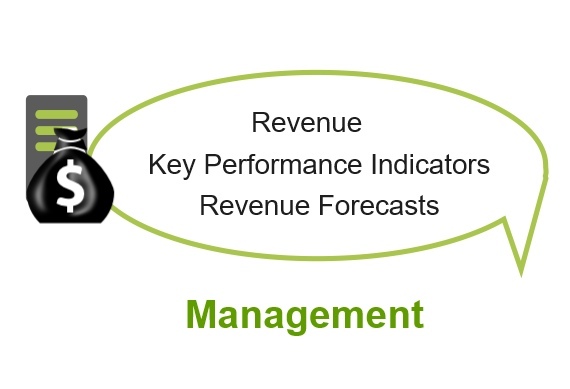 The Solvryn℠ Enterprise portal enables management to have real-time access to key performance indicators. The reports are built from the single repository that includes the actual invoices, payments and supply costs at the account level. These reports provide management access to high level summaries based on the actual accounting detail used by the accounting department. There is no need to wait for weekly, monthly or quarterly updates. All the revenues, losses, defaults, credit exposure, aging and other exposure reports are available at all time. Resource management requires the ability to obatin timely and accurate information regarding DER and resource availability. The Solvryn℠ Enterprise portal provides staff and management access to the real-time data that can be used in your third party planning and scheduling applications. Program management and tracking are facilitated by grouping at the lowest level of granularity (i.e. at the meter level) allowing for ultimate roll-up flexibility. Having access to real-time results is an essential part of being able to adjust and optimize your DER strategies. 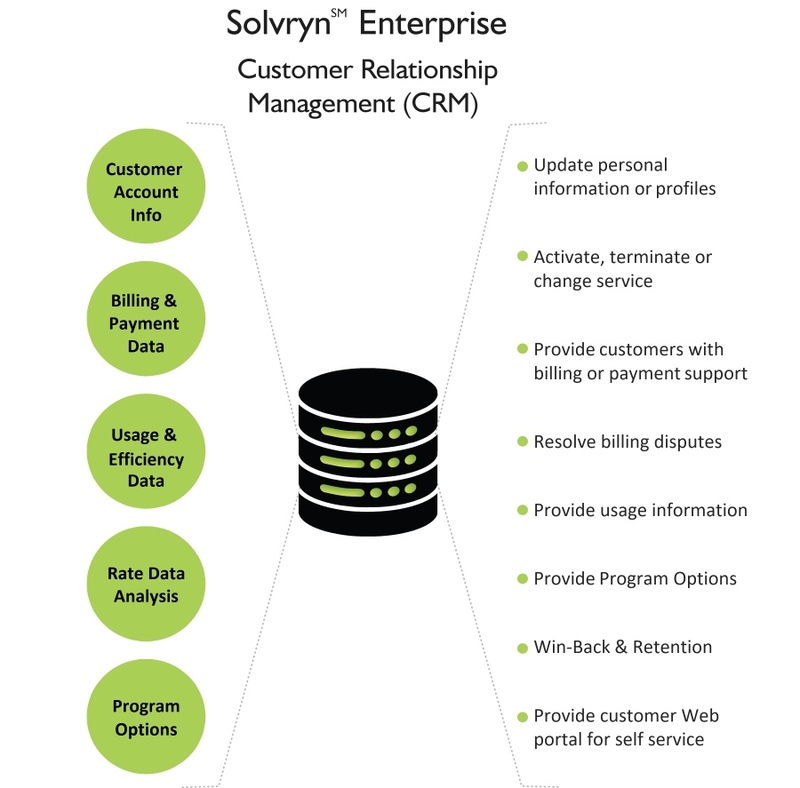 The Solvryn℠ Enterprise CRM is completely integrated with its deal entry, utility data management and billing applications. The Solvryn℠ Enterprise Web portal allows all authorized staff and management to access a comprehensive CRM solution. Through the CRM application you can view customer rate options, customer account details, customer service notes, invoices, payments, historic usage, pricing, GHG emissions, on-site generation, weather, prior call notes, and other important information related to that specific account. Solvryn℠ Enterprise provides account level detail that can be analyzed and then grouped with other similar accounts, based on user defined criteria. Those identified groups can be further examined to assist in the development of programs, rates, targeted marketing, and enhanced customer outreach. The key account staff and customer service representatives will have the tools necessary to assist with customer retention, upselling, or win-back customers that may have already disconnected. The retention and upselling offers are defined in the deal entry system and are made available in the CRM application, based on customizable work flows.